A combination of fear of the Ebola virus, weak public infrastructures in three of the world's poorest countries, and a slow response by the international public health community and world governments is reversing real progress in Liberia, Sierra Leone and Guinea. All three have had democratic elections after decades of political instability and conflict and, despite limited national budgets, were building clinics, schools and other essentials for economic development. Ebola – and the reaction to it – threatens to throw all three back into instability – but they are not alone in suffering adverse consequences of Ebola stigma. The first known Ebola case in west Africa was in the Nzerekore area of Guinea, on the border of Liberia and near the border with Sierra Leone. Epidemiologists, the specialists who trace disease, identified the presence of Ebola in March this year, after it had already begun to spread in the three-country region. Liberia was most affected; a major transport and trading road network heads south from the border to Monrovia, the Liberian capital. The virus also traveled south through Sierra Leone and around Sierra Leone inside Guinea, reaching Freetown and Conakry, the coastal capitals of those countries, as well – and has spread as far as Nigeria and Senegal. The United Nations World Health Organization (WHO) and the Centers for Disease Control (CDC) have now reported over 3,000 suspected cases and more than 1,500 deaths, although officials at both organizations believe the actual total of cases and deaths is multiples of those documented. Because Ebola is highly contagious for people in direct contact with the bodily fluids of infected individuals after they have begun exhibiting symptoms, and because the fatality rate in the current epidemic has exceeded 50 per cent, local authorities faced unprecedented public panic. The sight of medical workers – the minority who could obtain them – clothed in space suit-like protective coverings has intensified fear in both remote towns and crowded urban settlements. Understandably, many governments in the region and internationally adopted strict measures to avoid contagion, often under public pressure. Those measures included air and sea restrictions and land border closures, creating a de facto quarantine of Guinea, Sierra Leone and Liberia against the recommendations of WHO and such humanitarian groups as the International Federation of Red Cross and Red Crescent Societies and Medecins Sans Frontieres/Doctors Without Borders. WHO and other medical organizations continue to call for lifting of air and sea embargoes, stressing that the risk of transmission is low. So far, those calls have not been heeded. An African carrier, Royal Air Maroc, is the only international airline whose regular service to Monrovia and Freetown has not been interrupted. Brussels Airlines was forced to halt service briefly, when Senegal barred scheduled Brussels flights through Dakar from landing, but the airline quickly changed its routing and announced resumed service. British Airways suspended service in early August, and Air France flights have been irregular, with the French carrier announcing suspension of its flights to Liberia on Wednesday. Korean and Kenya airlines stopped flights weeks ago. Service to Monrovia by Delta Airlines ended today. The company made the announcement in July citing insufficient passenger demand. "Right now there is a super risk of the response effort being choked off because we simply cannot get enough seats on enough airplanes to get people in and out, and get goods and supplies in," WHO's emergency chief Bruce Aylward told reporters Thursday as he launched a nine-month $490 million Ebola battle plan. He was echoed by the UN envoy on Ebola, David Nabarro, who criticized airlines for scrapping flights, warning that increased isolation of Ebola-hit countries makes it almost impossible for the United Nations to carry out its work. Shipping lines with cargo destined for the region have been bypassing the port of Monrovia and other anchorages. Liberia's information minister, Lewis Brown, says the embargo is strangling the country. Besides worsening the situation on the ground, the virtual quarantine sends negative signals about Africa throughout the world and threatens the economies of countries that had been attracting investment at increasing rates. The African Development Bank indicates that the outbreak could cost the Mano River Basin countries - Guinea, Sierra Leone, Liberia and Cote d'Ivoire – large losses in Gross Domestic Product and economic growth. Even countries without a single known Ebola case are being hit. Some west African nations have started seeing large cancellations in their growing tourism industries. A number of regional and international seminars and conferences have been postponed in the region, though the host countries may be miles from the areas where Ebola has been found. Kenya and South Africa – countries further from the Ebola epicenter than much of Europe – are experiencing huge losses in their own tourism industries. The South Korean national carrier, Korean Air, said the suspension of its direct flight between Seoul and Nairobi, Kenya's capital, was due to Ebola. This week, the United States national basketball team cancelled a trip to Senegal. Africans traveling in Europe, Asia or the Americas are under more scrutiny than other travelers, who may have had more recent contact with Ebola areas than most Africans. During the recent U.S.-African Leaders Summit held in Washington DC, it was uncomfortable to note the debate amongst American pundits on prime time TV and radio about the risk of African delegates bringing Ebola with them. The following week, Nigeria withdrew its national team from the Youth Olympics in Nanjing, China, following discrimination against the athletes, who were quarantined and barred from training alongside other participants. On 27 September, the Russian news agency RIA Novosti announced that Uzbekistan's Public Health Ministry had asked the organizing committee of a wrestling championship in Tashkent to keep out west African athletes. In western Europe, including Spain, Italy, Germany and France, incidents of racially-tinged Ebola paranoia have surfaced. These challenges are accompanied a vacuum of a strong pan-African voices against the elevated fears of Africans exporting Ebola. An exception has been the steady, determined voice of African Development Bank Group President Dr. Donald Kaberuka, whose organization recently made a $60 million grant to help fight the disease. He personally visited Sierra Leone and Liberia, and Liberian President Ellen Johnson Sirleaf, thanking him during a meeting in her office, said, "Your visit is a strong signal" against isolation. African citizens and the African Diaspora are beginning to raise their voices and are discussing ways to pressure their political leaders to lift the quarantine imposed on affected countries. If the campaign is not effective enough, the entire continent may soon feel quarantined. 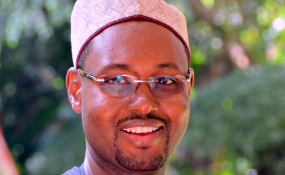 Amadou Mahtar Ba is executive chair, co-founder and former president of AllAfrica Global Media. He and other prominent Africans and media leaders have launched a GoPetition "Citizens Call to Action on Ebola". Copyright © 2014 allAfrica.com. All rights reserved. Distributed by AllAfrica Global Media (allAfrica.com). To contact the copyright holder directly for corrections — or for permission to republish or make other authorized use of this material, click here.